Have you seen this amazing lehenga before? No? This is Manish Malhotra designed lehenga worn by late Sri Devi's daughter Jahnavi Kapoor. This is such an adorable lehenga. We just wanted to share this beautiful lehenga with you so that if you're in a quest of a good lehenga then you can get some ideas for your dream lehenga. This could generally be wore in an occasion or your ring ceremony . This is a perfect combination of mix and match. 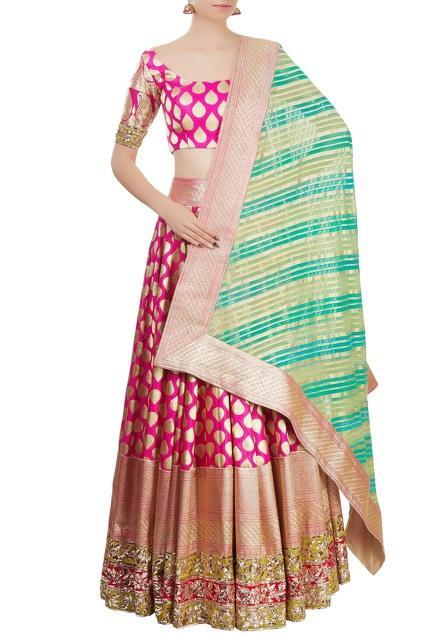 The green coloured dupatta goes perfectly with the pink lehenga. Also, this goes perfectly with a jhumka and you are beautifully ready for the party or wedding. Pink is a colour which goes and suits every girl. The golden embroidery on it makes it look very adorable.